A lovely bouquet of flowers is seen here in this French floral tapestry "Floral Cluster Beige". In this piece we see flowers in reds, peaches, whites and violets including a striped tulip, accompanied by greenery and foliage with some flowers fallen onto the table below. This floral still life art is a testament to the skills of French tapestry makers from the 17th century. 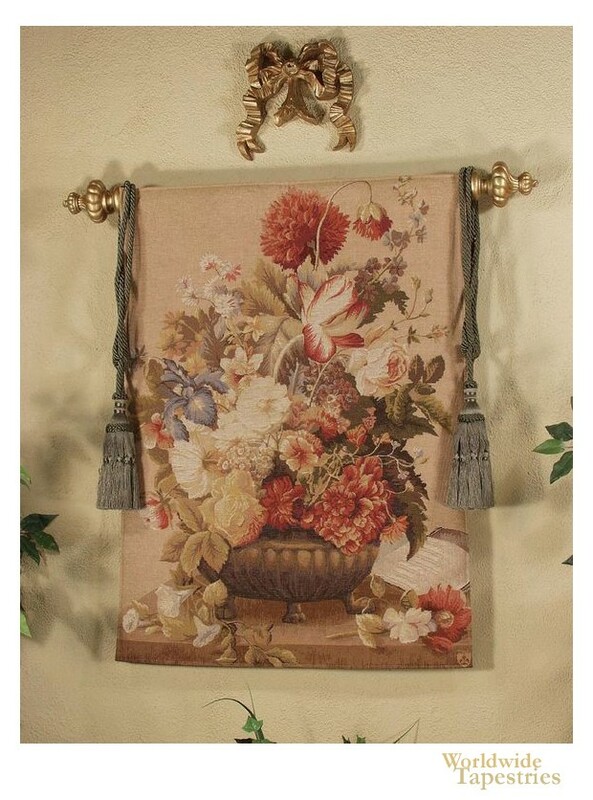 This gorgeous tapestry "Floral Cluster Beige" is backed with a lining and has a tunnel for easy hanging. Note: tapestry rod and tassels, where pictured, are not included in the price. Dimensions: W 28" x H 38"